Recently I had the opportunity to dry a one story house totally saturated from a leak under the kitchen sink with a Phoenix 270HTx and an Aquatrap AT450S. 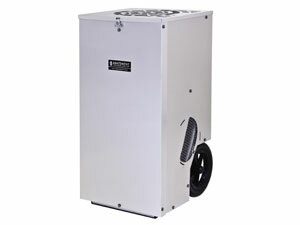 These two dehumidifiers are some of the newest on the market and both are able to dry in conditions over 90°. I was curious as to which one works best and these are my findings. First you should know this was fresh water and we got to it in less than 24 hours. We extracted with the Hydro-X and Vac-Pac and did not remove any baseboard or carpet and pad. The two dehumidifiers were set up on buckets to collect the water to compare the two units. Both units had access to the same air space and the temperature in the structure was between 95° and 98° the entire job. Day 1 both units were about equal in the amount of water removal, although the Phoenix 270HTx dehumidifier did pull about a ½ gallon more water. Day 2 – 4 was the true tale of how each worked though. Day 2 the Phoenix 270HTx pulled about 2 gallons more water and by the end of the job on day 4 the Phoenix 270HTx had pulled nearly 6 gallons more water than the Aquatrap AT450S over the 4 day job. Even though the product literature for the Aquatrap says it pulls 180+ pints per day we found that the Phoenix 270HTx rated for 161 pints per day out performed it. Another thing to consider is the electrical requirements of each unit. The Aquatrap pulls 12 amps while the Phoenix 270HTx only pulls 8.9 amps. When trying to dry a house with multiple dehumidifiers and air movers in it every amp you can save is important. Example on a 15 amp breaker I can only plug in the Aquatrap and nothing else. On that same 15 amp breaker I could run the Phoenix 270HTx and probably two low-amp axial air movers. So the difference could be significant on a large water loss where power is an issue. The Aquatrap does blow 450 cfm of air, while the Phoenix 270HTx only blows 380 cfm of dry air. However, I am not as concerned about the additional 70 cfm of air, since the 380 cfm machine removes more water. 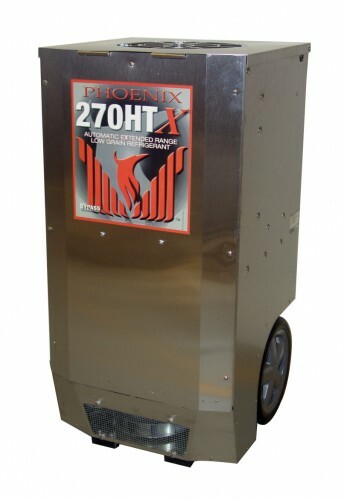 The Phoenix unit offers other features that make it excel over the competition, such as their patented bypass technology. This features lets the unit dry effectively in conditions over 90° with no manual adjustment. It also focuses the dry air toward the ground and has a ducting ring to attach plastic lay flat ducting when necessary. A small negative though is that the drain pump on the Phoenix unit only works when the unit is running. In previous Phoenix units the pump would work if the unit was plugged in but not running. This comes into play sometimes since the unit can collect water for 12-18 hours after it is shut off. Overall though the winner of this head to head battle of low-grain refrigerant dehumidifiers has to be the Phoenix 270HTx dehumidifier. As a restorer, I am mainly concerned with how much water the unit removes while using the least amount of electricity possible and this dehumidifier excels at both. This article was published on Thursday 25 October, 2012.